Hi, everyone! Before anything else, I'd like to say Happy New Year! to all of you! I'm starting the year with a colorful new year nail art. I'm still wearing my nails short due to terrible breakage. Hopefully, it will grow back (soon) to the length I'm comfortable with. It's 2011 and I'd like to begin the new year with something happy to look at. But first, a little teaser on how I came up with this design. 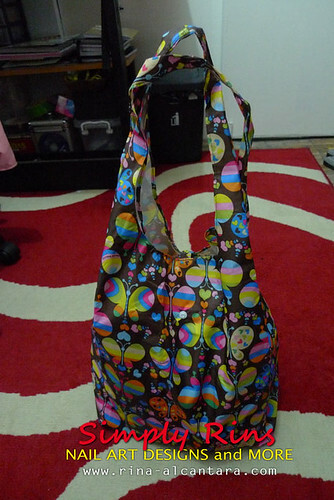 Last Christmas, Thea (a friend) gave me a portable bag for a present. 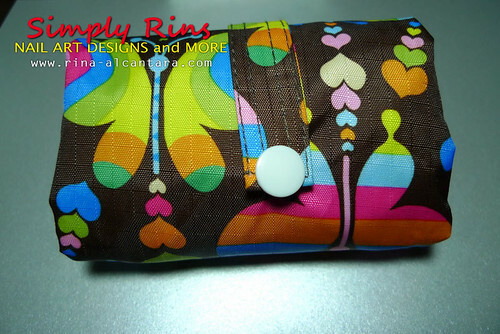 I immediately loved the design because the pattern is made up of colorful butterflies! Yes, I adore butterflies. You may ask how this bag is portable. Well, in the next photos, I'll be showing you how it folds to approximately the size of a hand. Since I received this lovely gift, it has been in my bag constantly. It's really handy and helps me promote environmental friendliness! I can't find exactly what the materials were used for the compact tote bag but it feels like a very thin version of the material used for outdoor tents. It's really sturdy and water repellent too! Anyway, I was trying to come up with a new year nail art design that will have lively colors and what better inspiration than this bag! Thanks Thea for this extremely useful gift! Left photo shows what the bag looks like when folded. 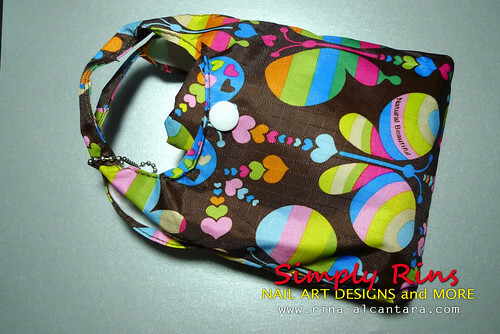 The right photo shows the folded bag inside a miniature version of the tote bag. Cute noh? I've taken this compact bag to the grocery, the beach, and out of town trips last December. Instead of using plastic bags during grocery trips, I ask the staff to place my goodies in this bag instead. Since it's water repellent, it served as my beach bag during a recent surfing trip. It also acts as a shopping bag! It became very handy when shopping for souvenirs and gifts during my out of town gimiks. New year nail art by Simply Rins! 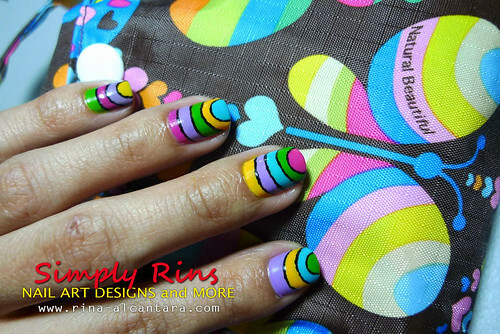 I used 5 colorful nail polishes for this design. Namely, Faceshop PP402 (pink), Faceshop GR502 (green), Elianto Turquiose (blue), OPI The It Color (yellow), and OPI Do You Lilac It (lavander). Everything was applied using a nail art brush. I think this nail art made my short nails look a little longer. I added black outlines to separate the colors better. This new year nail art design looks like a rainbow and is really quite easy to do. If you're looking for a simple design to wear for the new year, you want out to try something like this. You may choose the change the orientation of your curve lines per nail if you like. Looks really attractive even from a distance. The nails and the inspiration. I wish 2011 will be good. I'm looking forward to sharing more nail art designs with you this year. Thank you all so much for your continuous support. Very cute. Love the color combo. I also have a bag like that, that I carry around in my purse. Thanks so much girls! Yes, I'm really loving that bag! It's so useful! :) Happy New Year!!! Wow, this is veryyy in your face, but therefore I love it! Nice!